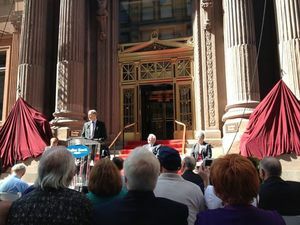 PITTSBURGH, PA--(Marketwired - Jun 5, 2013) - For 138 years, two dignified figures watched over Pittsburgh's financial district, protectively perched outside of the city's oldest bank. As people and businesses came and went, the figures remained on their thrones, witnessing the growth and prosperity of America's most livable city. After a three-year absence, the kings of Fourth Avenue are returning. The Dollar Bank Lions are back -- and roaring to be revealed. The Lion Legacy: In April of 1871, Dollar Bank opened its Fourth Avenue doors to Pittsburgh. Famous for offering savings accounts that could be opened with as little as one dollar, Dollar Bank became an institution known for its personal touch and deep ties within the community. 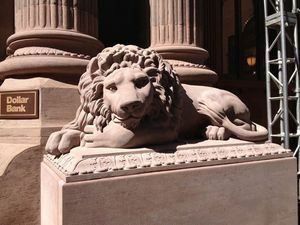 That same year, two stone lions were carved in place at the main entrance of the Fourth Avenue Building, symbolizing guardianship of the people's money. 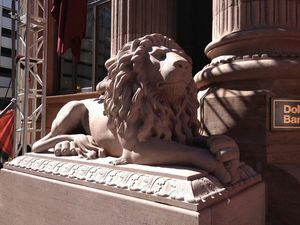 Each stately lion was sculpted from a single block of quarry-bedded brownstone by Max Kohler, and stayed on the steps until removed for restoration in 2009. "The lions are a symbol for Dollar Bank's commitment to the communities we serve," Dollar Bank's President & CEO Robert P. Oeler said. "They depict strength and a longstanding heritage of service and reliability." Preserving Tradition: After the original lions were restored, Dollar Bank relocated them inside the walls of the Fourth Avenue Building in February 2012. It was then that Master Carver Nicholas Fairplay went to work on brand new lions. Nicholas Fairplay, a European architectural sculptor, has over 30 years of experience and specializes in hand-carved stone and marble ornament. His work can be seen all over the world and in the heart of Pittsburgh. Some notable pieces include key elements of Westminster Abbey, St. Paul's Cathedral, Carnegie Mellon's College of Fine Arts Building and many private residences in Western Pennsylvania. Over the course of two years, Fairplay carved exact replicas of the lions in his studio based in Oberlin, Ohio. Working off 3-D models of the originals, he recreated the lions that will last for centuries to come. The Roaring Reveal: On June 5, 2013, Dollar Bank will present a 'roaring reveal' of the new kings of Fourth Avenue, welcoming the lions to Pittsburgh. 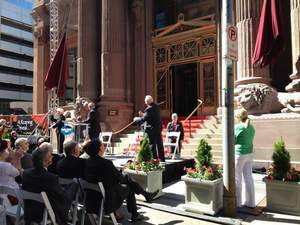 Robert P. Oeler, Doreen Boyce, a number of Dollar Bank's Board of Directors, Dennis Yablonsky, CEO of the Allegheny Conference, and Rich Fitzgerald, will participate in unveiling the lions. Guests will also get to tour the new Fourth Avenue Heritage Center. Dollar Bank is the largest independent mutual bank in the nation with assets of more than $6.7 billion. * Today, Dollar Bank operates more than 60 locations throughout the Pittsburgh and Cleveland metropolitan areas. For 158 years, Dollar Bank has grown to become a large, full service, regional bank committed to providing the highest quality of banking services to individuals and businesses. Dollar Bank (www.dollarbank.com) is headquartered in Pittsburgh, Pennsylvania. The draped lions await their big moment in front of the Dollar Bank Fourth Avenue Building. A close up of the lion to the left of the entrance. A close up of the lion to the right of the entrance.